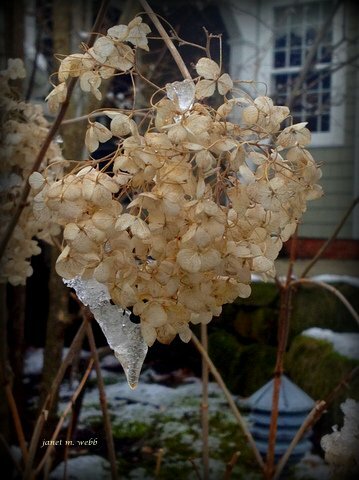 It’s Wednesday, and Rochelle has ushered in another 100ish word flash fiction, with a prompt photo by Janet Webb featuring a big icicle dangling rather precariously off a bush. I sure hope it doesn’t fall on somebody! I’ve gone for a rather silly one this week. For other contributions, click on the blue froggy! Tributes were paid today to Britain’s best-known sunbather, Douglas “Fruitcake” Norris, who died in his back garden in Upper Littlebridge, aged 79. Norris, famous for sunbathing in all temperatures, was sadly impaled through the brain while catching some rays underneath a large icicle, which became dislodged in rising temperatures. I love this. Those darn icicles. RIP Fruitcake. I was going to say “maybe next time he’ll watch where he’s sunbathing” but then I remembered he’s dead. I’m glad I made you smile. The icicle was probably acting as a lens and magnifying the rays – at least he went doing something he loved! Haha. A little dark humor. Fun. Glad you liked it! I haven’t done any dark humour for a few weeks now so it was about time. I reckon it would make a good film at 11. Glad to see that his nuttiness is alive and well in his daughter, even if she doesn’t realise it yet. I suspect she will be very proud once people start to point out how like her lovely father she is. I love reading your flash fiction – one never knows what might happen next. Haha – well done! Greatly imaginative and of course funny! “while dangling upside-down from her washing line in her underwear”…those lines are what makes your stories fun to read. Have you ever been committed for your lunacy? I thought I saw you on the lawn of the rest home up in Upper Littlebridge. I love this story. It is great. I’m hoping there aren’t any chemical dumps in England but there must be a few around the place. I hope the daughter will be okay too, I’m guessing she does this a lot! Sunbaking in winter? I’m guessing those chemicals might have had high concentrations of lead. I reckon it’s a whole cocktail of chemicals which has caused their odd behaviour. Glad you liked it! This was a perfect story. Funny and lunatic and spot on serious. I am still chuckling as I swing upside down from the clothesline and type this comment. Well done. Thanks! I’m glad you spotted the little serious note as well. Careful on that clothes line! You have exceeded all expectations. I laughed out loud and am grateful I wasn’t drinking at the time. I surely would’ve spewed coffee from my nose. Brilliant, if not twisted, bit humor. I’m so glad I made you laugh 🙂 That’s always good to hear. I’m glad you liked it! Yep, it ended on a serious note. On a tangent, Icicles are the perfect murder weapon. It’s a virtual lock your fingerprints won’t stay on the melted water…. And you don’t get any of those awkward questions about the missing knife in the knife block. If you loved the father, you’ll love the entire family. I used to hang with the daughter myself. Hahaha! Some people are that way without any chemicals at all 😛 They don’t help, though. They certainly don’t. I expect even without the chemicals this family would have been described as “eccentric”. Cute story. It made me shiver just to think about sun bathing in those temperatures. At least he went out doing something he enjoyed. It was quite a chilly week of stories all round thanks to the photo! Wow, nasty. I imagined it could happen, they can get very large and sharp. Ha! This is great, Alistair. The apple doesn’t fall far from the tree, and now all the pieces are coming together with the chemical waste. The damage has been done. Oh, this is really funny. Thanks for the laugh. Impaled by an icicle. Oh, ouch! Like father, like daughter. Poor people! Funny characters, funny story. We’d all better watch out where we sunbathe. Not so much for the icicle risk, but for what’s beneath our feet, in the soil and in the air we breathe. Indeed. Without the chemicals he probably wouldn’t have been out there in the first place.